Our last day in Canada. I’m sorry to be leaving as it has been a really good visit. We spent the morning climbing Mt. 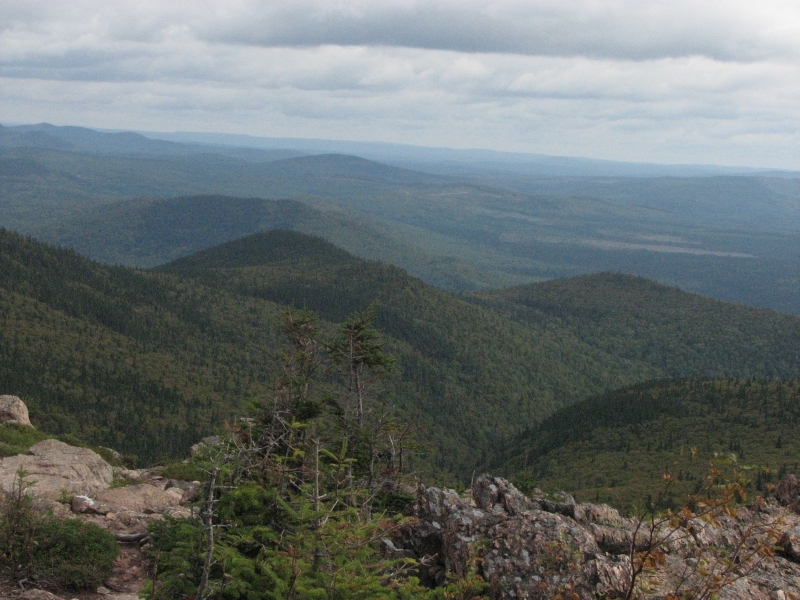 Carleton, the highest mountain in the Atlantic Maritimes. It was actually something of a disappointment. 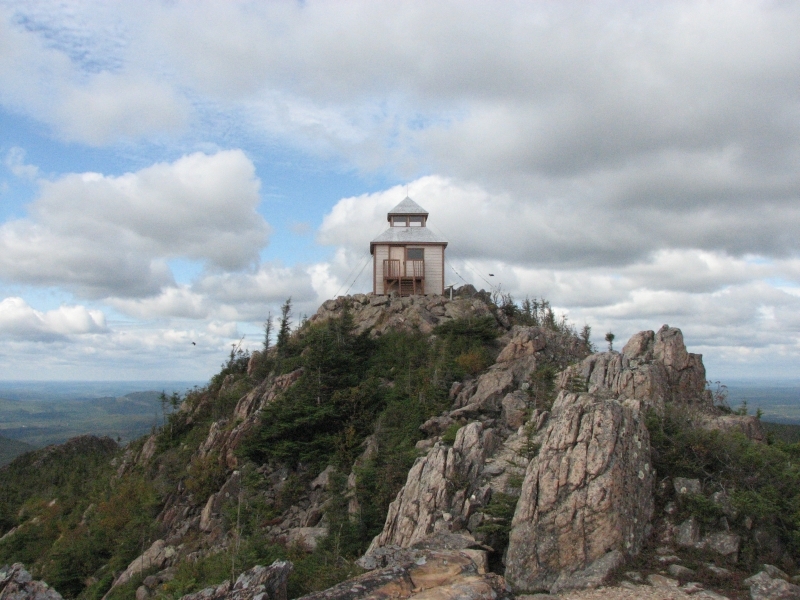 The trail up was fairly easy, following an old woods road to the fire warden’s cabin, then climbing on very rocky trail to the summit, an enclosed fire lookout. The view from the top was good, with lakes in one direction and green hills in all directions. 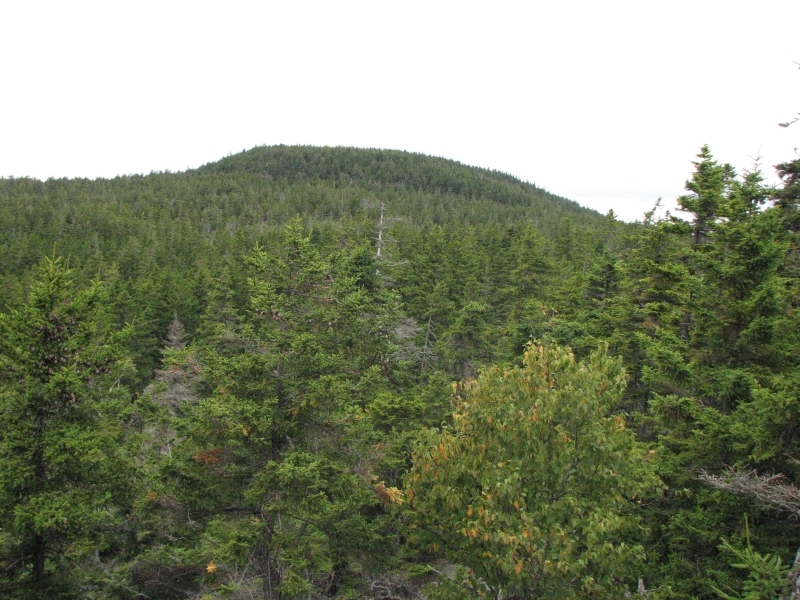 One mountain nearby had been clear-cut, but the park itself was forested. 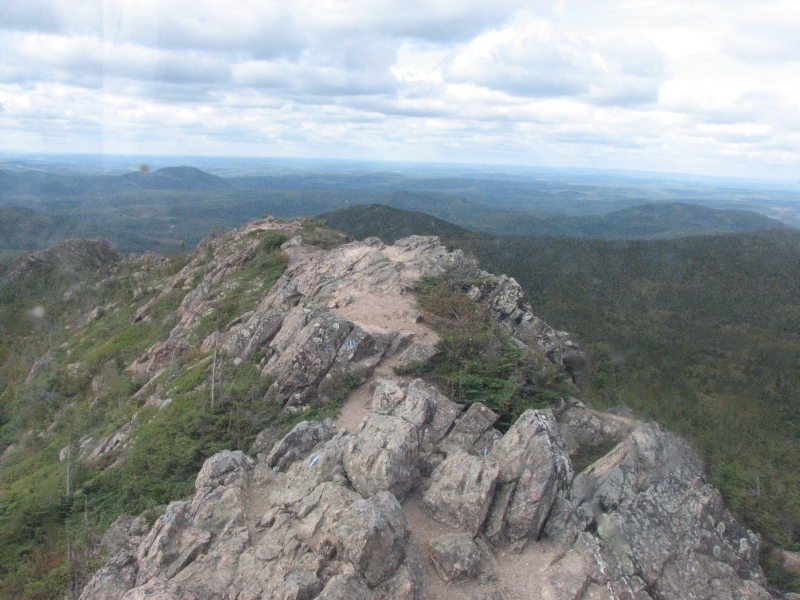 At the top, we had a choice of routes: one that followed the narrow rocky ridge and another that descended steeply over the rocks, but then proceeded through the forest to meet the other trail. It was really windy, so we took the more sheltered path. Clambering over a knife-edge ridge in high wind looked dangerous. As it was, the little bit of rock scrambling that we did hurt both of us. The knees don’t like steep descents on rocks. It reminded me of the AT, and not in a pleasant way. The rest of the descent wasn’t bad. Part of it was along a green mossy stream that was quite pretty. What bothered me most about the trail was the human element. There was a lot of trash along the trail, especially used toilet paper, and vandalism both in the lookout tower and on the trees along the trail. That irritated me more than the rocks. Although clouds built up as we were climbing, it never did rain. We left the park and bought a few groceries and butane for the stove at the Coop in St. Quentin, then headed to the U.S./Canadian border crossing at Fort Kent, where we were pulled over and the truck was searched. I think they were concerned that somebody was hiding among the blankets and pillows in the back. It’s the first time that has happened. Maybe they were curious about why a couple from Maryland has spent a significant part of the past three summers in Canada? 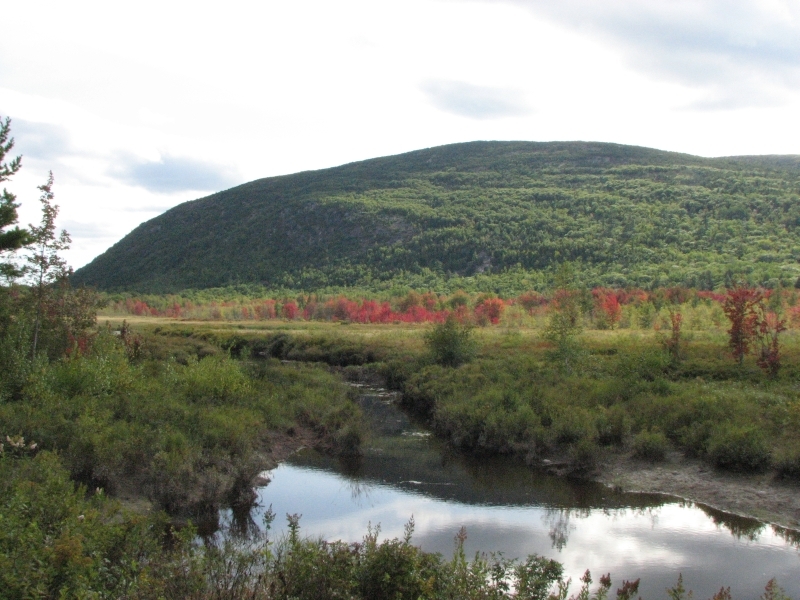 We drove south through hills and farms to Millinocket, where we got a motel room and ate dinner at the Appalachian Trail Café. We spotted a few AT hikers in town. How I envy them! I know, my life is terrific. However, I remember what it was like to be thruhiking. I miss those days. Hopefully, they’ll come again. I love our long driving trips, but it’s not the same as doing a long distance hike. For me, long distance hiking is more than just being a tourist; it's a lifestyle, and, at times, it has the sense of being a pilgrimage. As much as I love seeing the places we have been able to visit the past few years, we have just been tourists, transient visitors with no real stake in the places we visit. There isn’t the same sense of purpose I find when doing a long hike. There isn’t the same kind of challenge, both physical and mental. When I am planning a thruhike, or hiking it, or writing about it afterwards, I have a goal that really matters to me. I have resolve, a drive to succeed, happiness in the endeavor and pride and satisfaction at the successful completion. For the duration of my hike, my life has a real purpose. In a PCT book called "The Cactus Eaters", Dan’s father asked if his hike was supposed to be a substitute for real accomplishment. That line hit me hard. I think there’s some truth to that. I love the long distance lifestyle--it brings me a lot of happiness--but I recognize that it does lack greater significance to anybody but me (and Jim of course.) When we do our long drives, there is a lot of enjoyment, a lot of pleasure, and a certain amount of education, but not the same sense of purpose, of continuity, of meaning, that we get when doing a thruhike. If we go here instead of there, it really doesn’t matter. All directions are equal. It can be good to live in the moment, to be completely flexible and take what comes. But it also feels a lot like aimless wandering, without meaning or purpose. It is a lot of fun. We even learn a lot, about the past and present. And that has a value. I can’t deny that. I know how lucky we are to have been able to explore North America as much as we have the past three years. We’ve been to some incredible places and seen a lot of beauty. But still I envy the thruhikers. I can’t help it. One problem with staying in motels instead of camping is we stay up so late. Late nights make for a late start in the morning. This morning we spent time on the phone and on the computer and didn’t end up leaving the motel until 10:00. Breakfast was followed by a long overdue stint at the laundromat. We spoke briefly to a few thruhikers who just finished the AT. 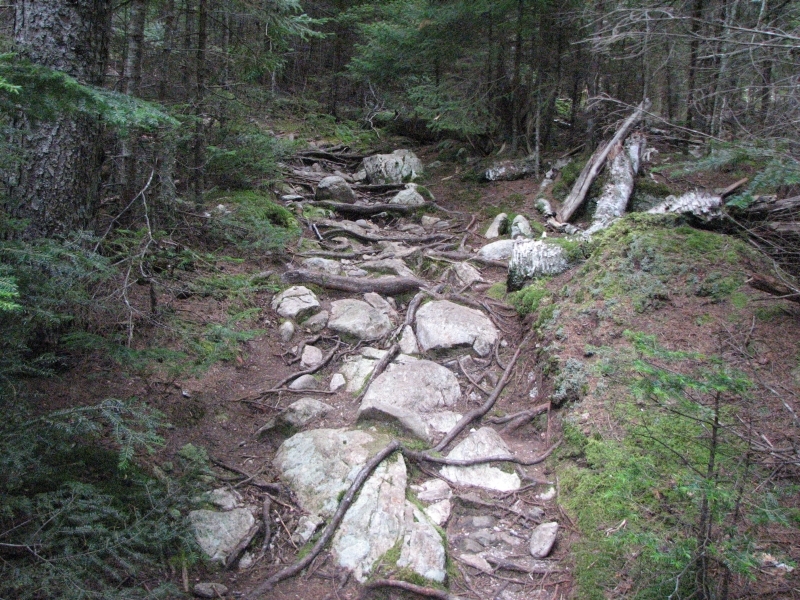 Result was, we decided to head out to Baxter State Park to revisit the trail there. 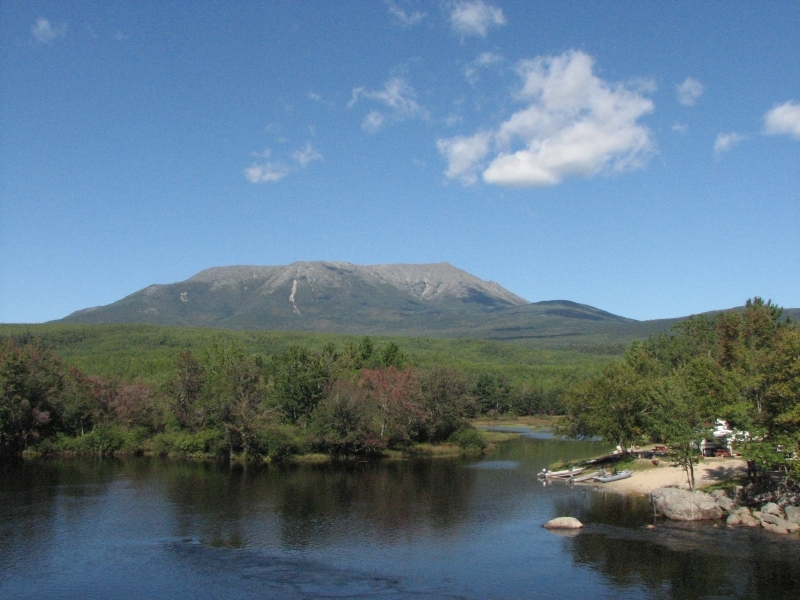 We drove a rough road out to Abol Bridge, where we took pictures of Katahdin, shining in the sun, then drove into the Park. I wanted to hike, but it was too late to go far, so we ended up turning around at the toll booth when we learned it would cost $13.00 just to enter the park. I didn’t want to spend that much money just to look at Katahdin, especially since we had already gotten a good view from Abol Bridge. The whole experience was rather bittersweet. 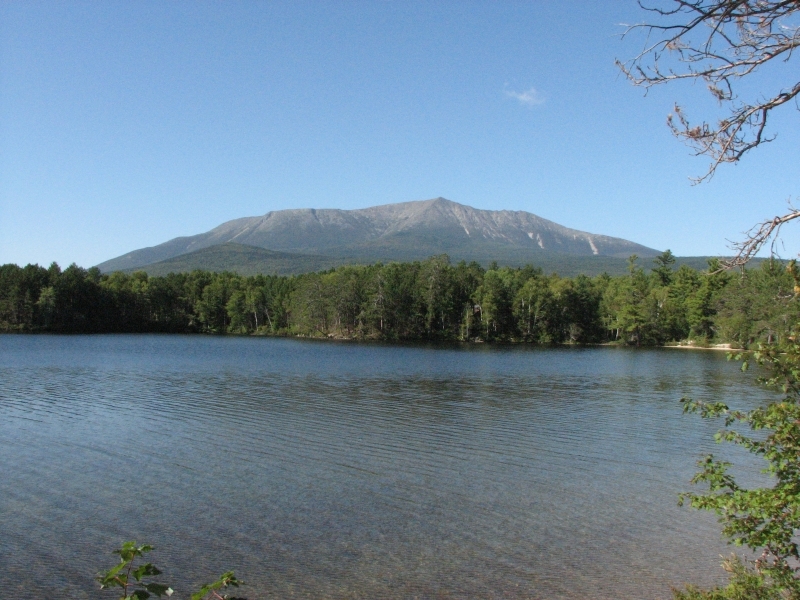 Seventeen years ago, Jim and I climbed Katahdin together. We never imagined how our lives would turn out, that we would marry, build a life together, even hike other long trails. 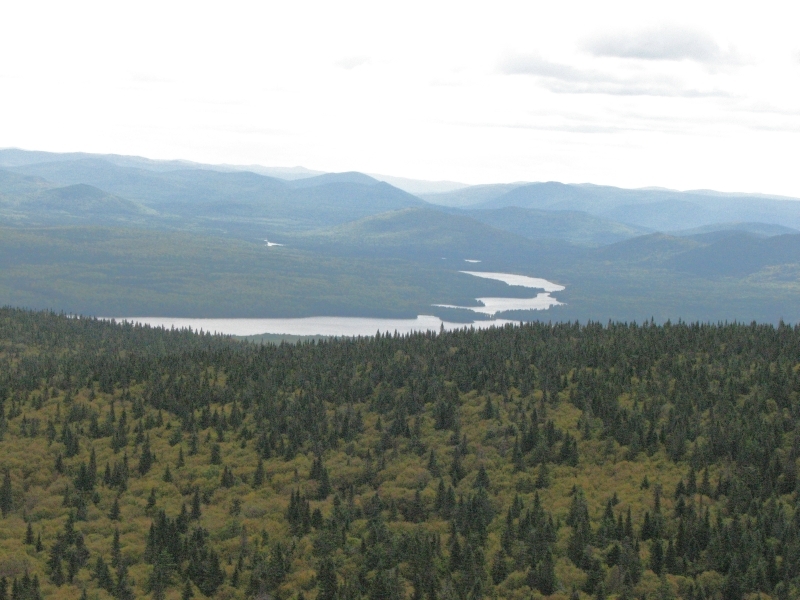 At that time, Katahdin seemed to be the end of a dream; we didn’t realize it was just a waypoint. Talking to the hikers this morning was funny. They are so happy to be finished; they can’t imagine wanting to do another long hike. I remember feeling that way. I also remember how quickly that changed. We ended up last night at a campground at Camden Hills State Park. 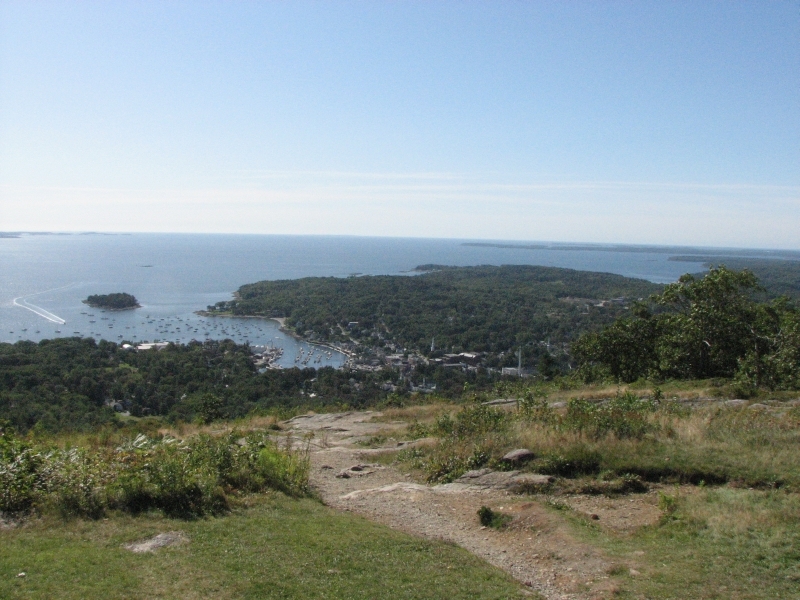 This morning, we began the day by driving to the Park lookout on Mount Battie. 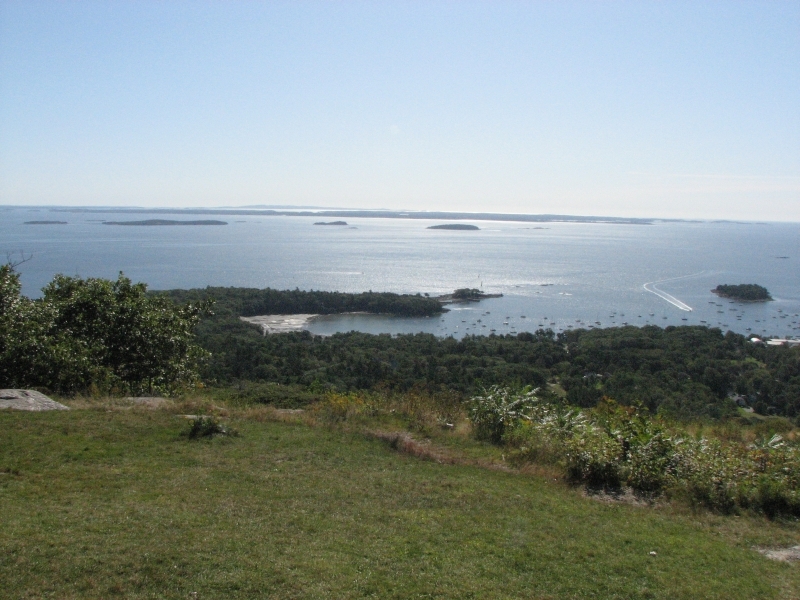 There were beautiful views of Penobscot Bay below, with blue water, sailboats, Camden Harbor and the many islands out in the Bay. We then did a short but somewhat strenuous climb up Mt. Megunticook. There is a viewpoint at 1300’ where we stopped to look out over the Bay. It was pretty much the same view as on Mt. Battie, just 420’ higher. We climbed about 1100’ in a mile, steep and slow. 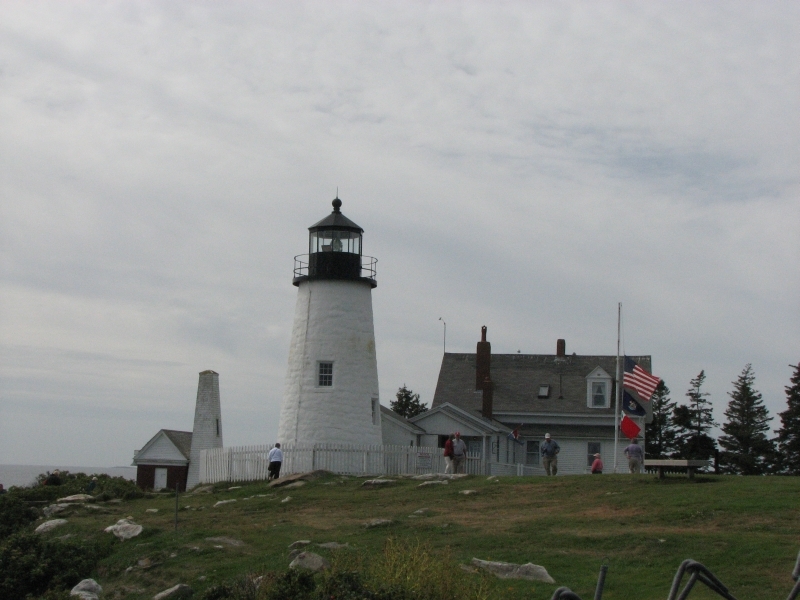 After our hike, we headed south to Boothbay Harbor to meet Dad and Betty for a short visit. This is the first time we’ve been able to meet them up here. Route 1 is a busy tourist road, with many tourist towns, filled with hotels, inns, shops and restaurants. It was much more developed than I expected. 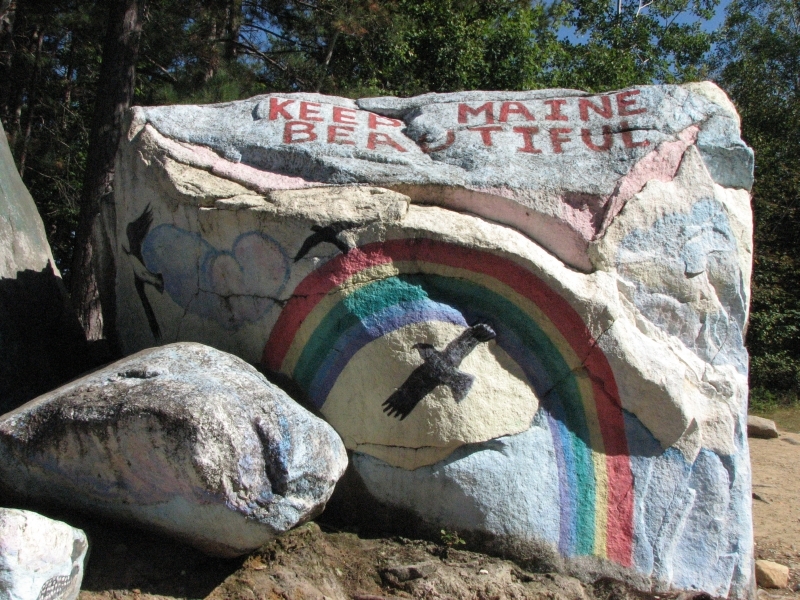 Somehow, my mental image of Maine’s coast was much more wild than the reality. We did see two deer today, so it’s not entirely civilized. We spent two days with my Dad and his wife, Betty, touring the Booth Bay area, eating lots of lobster (“when in Maine . . .”) and enjoying their company. For the past 10 years or so, they’ve spent a month in Maine in the summer or fall. Both of them love the ocean, plus it’s a good time of year to escape the heat of Houston. 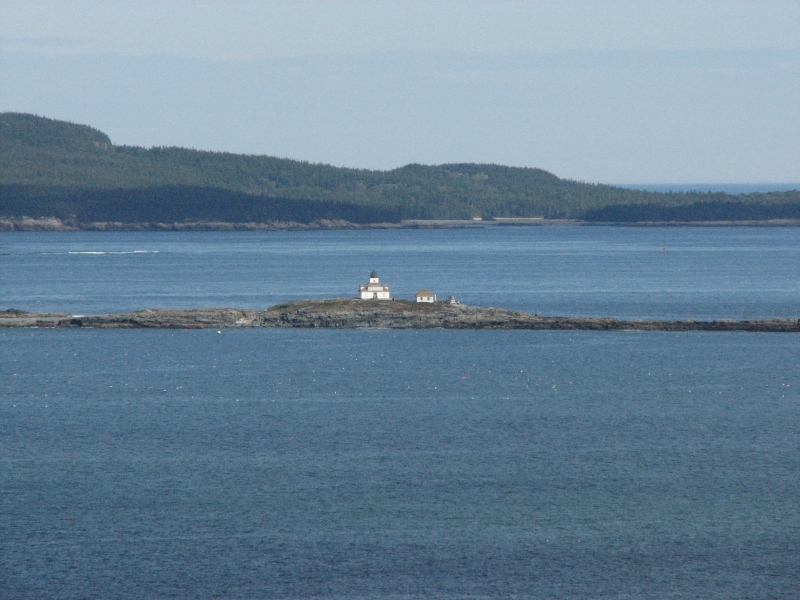 Today we enjoyed a leisurely breakfast with them, said farewell, and then headed north to Acadia National Park. On the way, we stopped at five bookstores, one new and four used. The Friends of the Library bookstore was the best one, with ten cent books, but there was a good one in a garage that was well organized and had a lot of interesting books, though many were out of our budget. One store kicked us out after only ten minutes. Evidently they figured that we were just browsing and not likely to buy high priced art books. The last shop was in a barn and smelled damp and musty. It was very crowded and not well organized; the kind of store that drives me crazy and usually sends me out empty handed. Traffic slowed us down more than I expected. We stopped at LL Bean's outlet store and the Acadia Visitors Center and finally reached the National Park campground around 6:00, just in time to cook dinner before dark. We got the last site, supposedly. 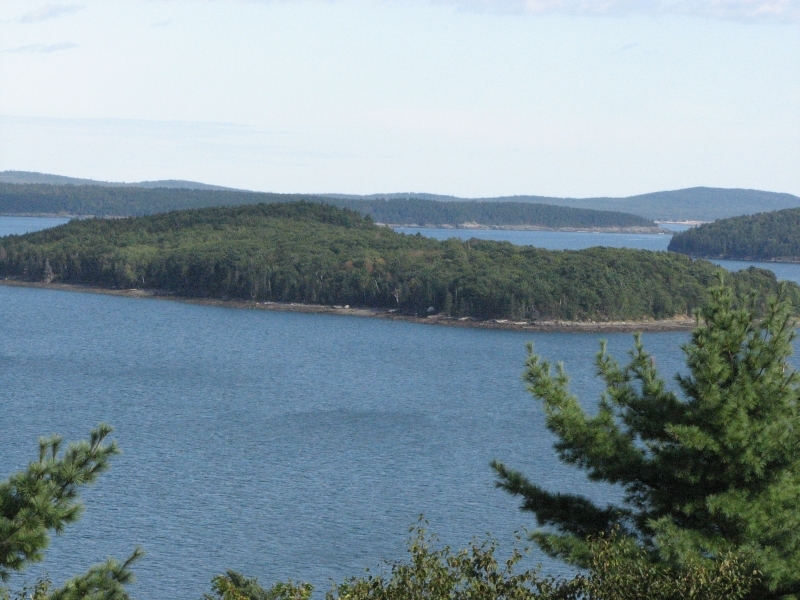 We drove through busy Bar Harbor, which was as much of a zoo as I expected. We were happy that we weren’t staying there. Tomorrow we’ll start exploring the island. We did see two more deer on our way today. It rained lightly in the night and again while we were eating breakfast. 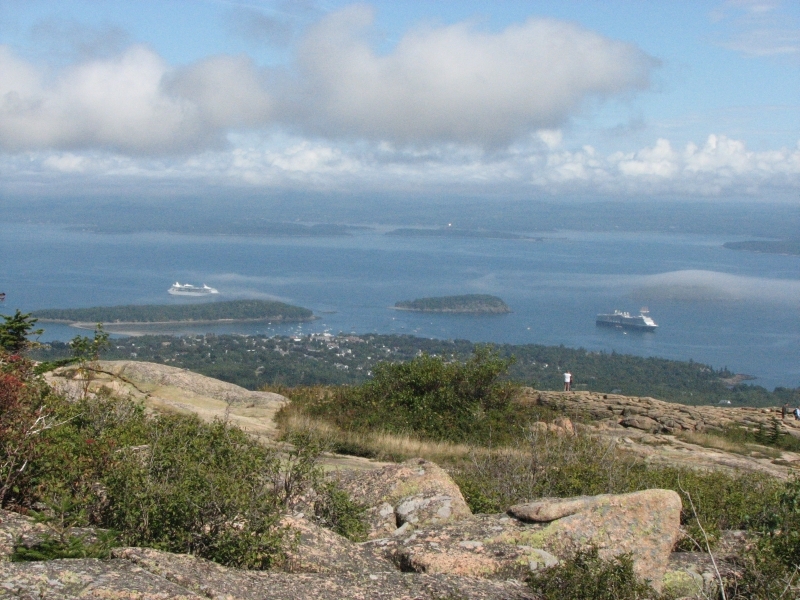 We read in the car awhile, then headed up the 20 mile scenic loop drive to Cadillac Mountain. We drove to the top, after a couple of stops to look at views. 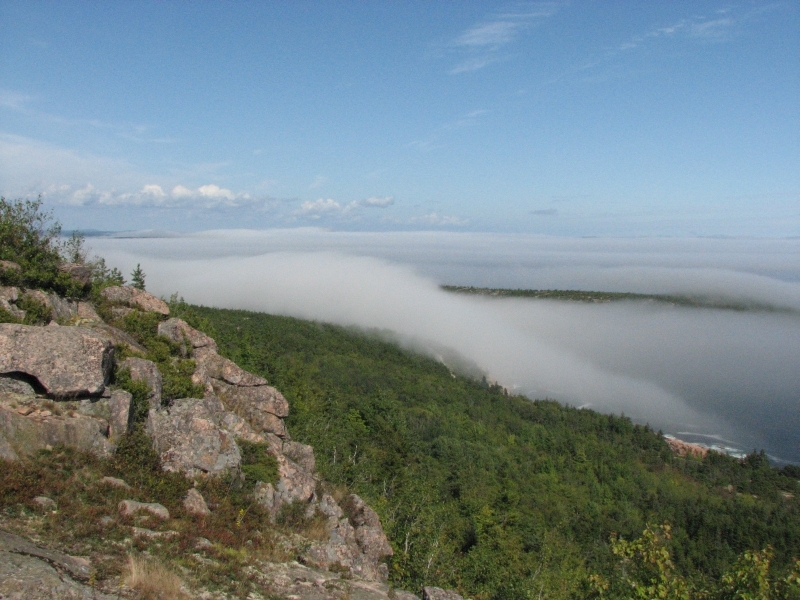 The coast was enshrouded in dense fog, but the mountain top was clear. It was also very crowded. There are three cruise ships in town, plus multitudes of families in cars. We walked a .4 mile loop on the open ledges, then headed down to the shore. At the Gorham Mountain trailhead, Jim and I climbed up to the top of the mountain on a trail that had some easy rock scrambling. Jim turned around at the flat open ledges on top of Gorham, while I continued on down to Sand Beach, where I headed back to the car on the Shore Trail. 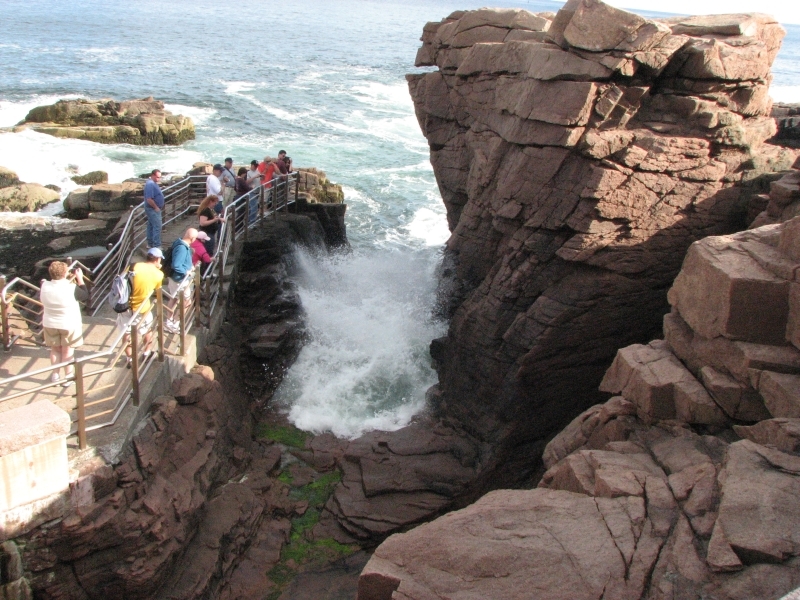 Thunder Hole performed for me, but I was seriously put off by the hordes of tourists there. 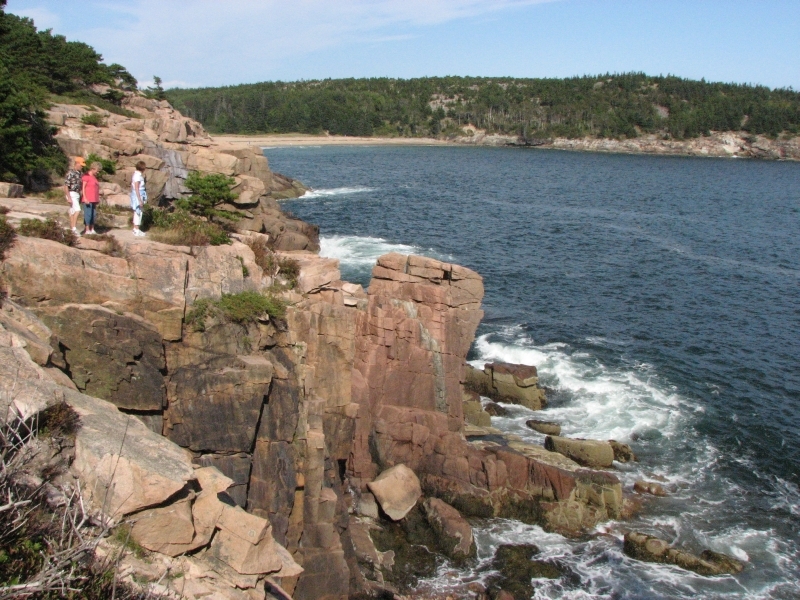 Acadia is the second most visited National Park in the US. I didn’t believe it until I saw how crowded it is, even in mid-September. 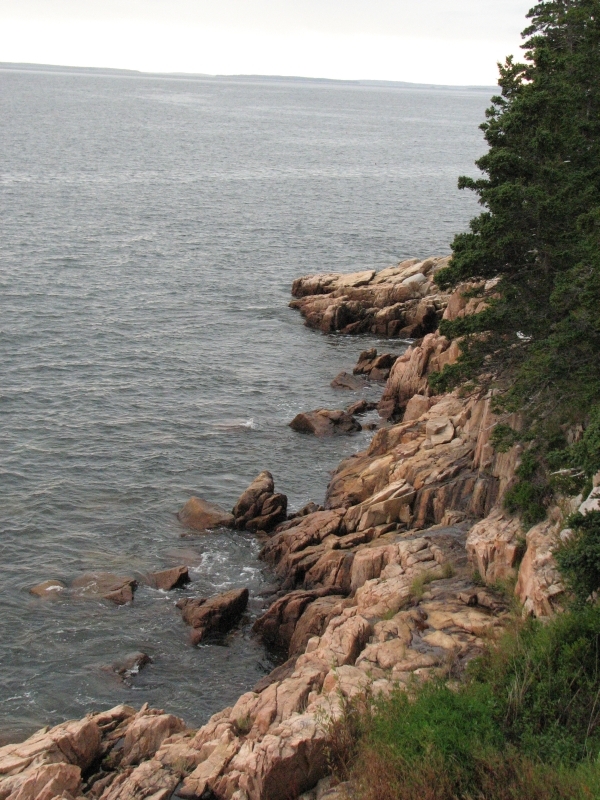 There was still fog along the shore, but there were views of the pink granite rocks and sea spray. After my walk, we drove to Jordan Pond House to get some of their handmade ice cream. Since it was quite expensive ($5.25) we decided to go whole hog: I ate the blueberry crumble with blueberry ice cream and Jim got one of their famous popovers filled with ice cream and covered in chocolate sauce. Our afternoon snack ended up costing $18, with tax and tip, but it was nice to sit out on the lawn looking at the view, while we ate our treat. We continued to another part of the island with some nice harbor views. 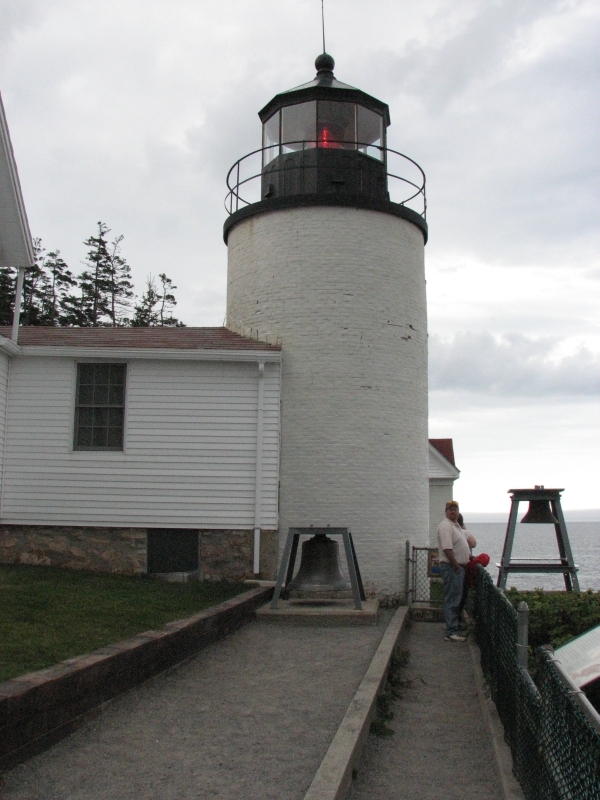 The lighthouse at Bass Harbor wasn’t particularly exciting, but I enjoyed the view of rain over the distant islands. 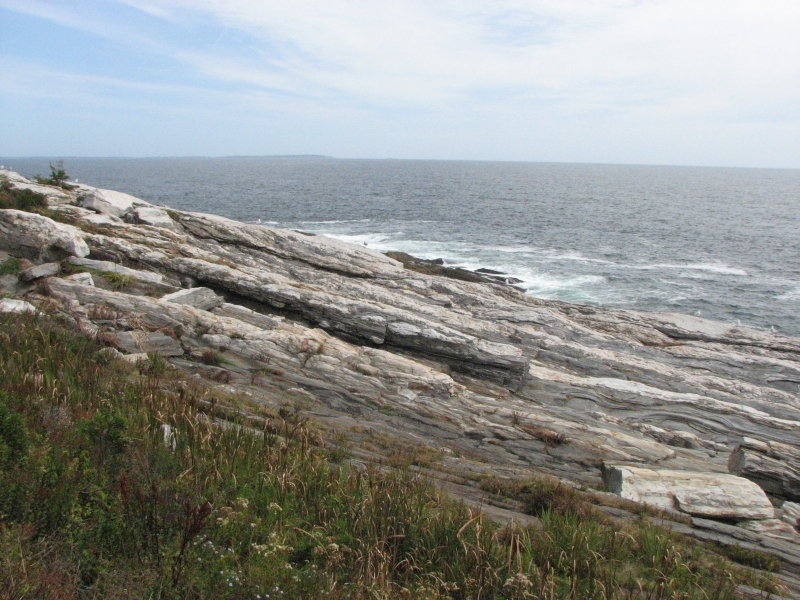 The Maine coast is swarming with small islands. They used to all be inhabited by fishing families, but now only a few have year ‘round inhabitants. We found a campsite at Seawall Campground. It sprinkled on us a couple of times, but only for a minute or two. Despite fog and clouds, it was a good day. 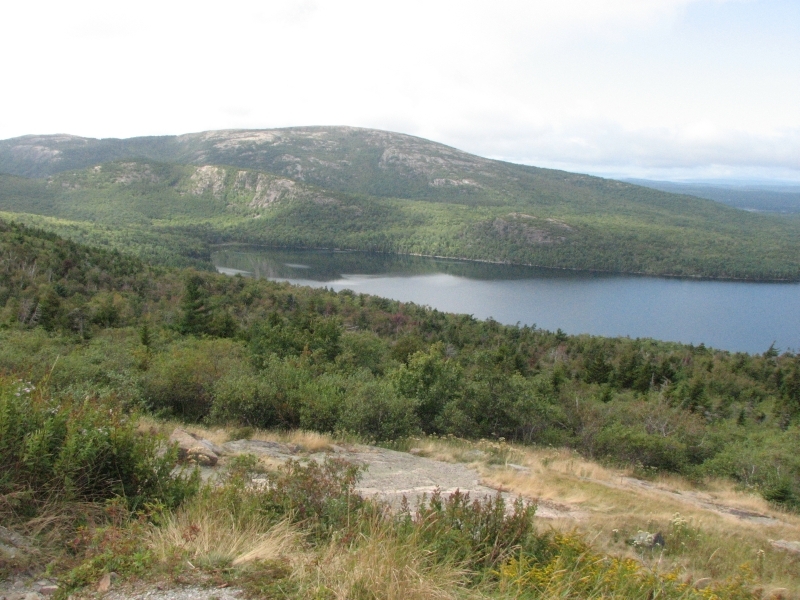 I enjoyed our short hike up Gorham and the views of the coast and the ponds. 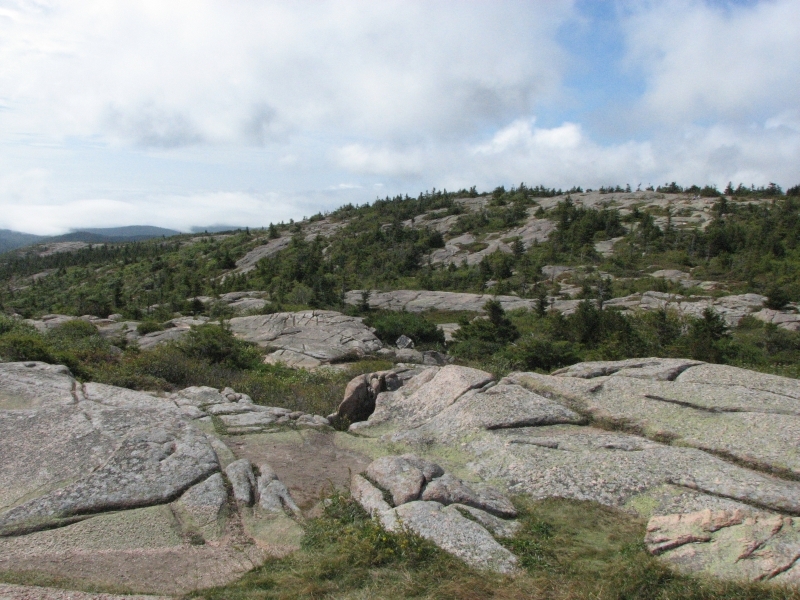 The mountain tops are broad open granite balds – very scenic and easy walking. It’s just the crowds I disliked. Trouble again, though the day started out well. 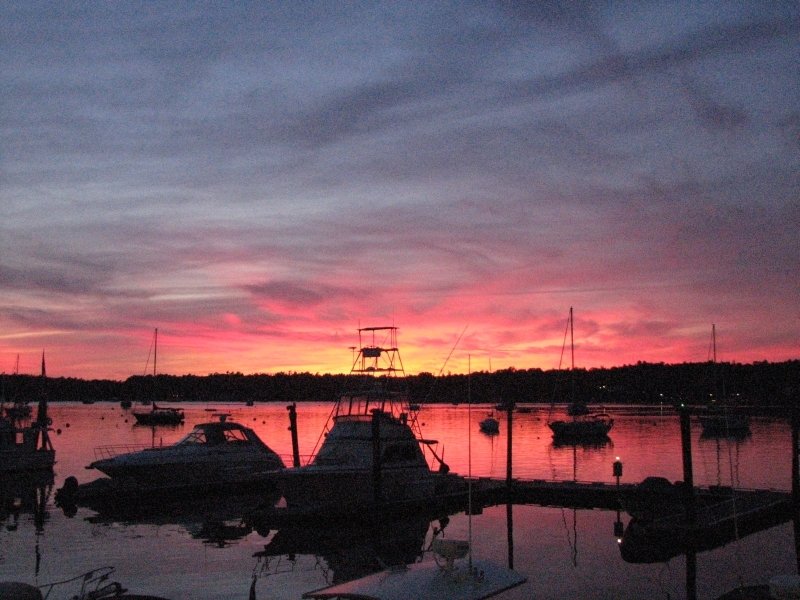 A few miles from Seawall Campground, there is a short 1.2 mile loop hike along Ship Harbor Cove. 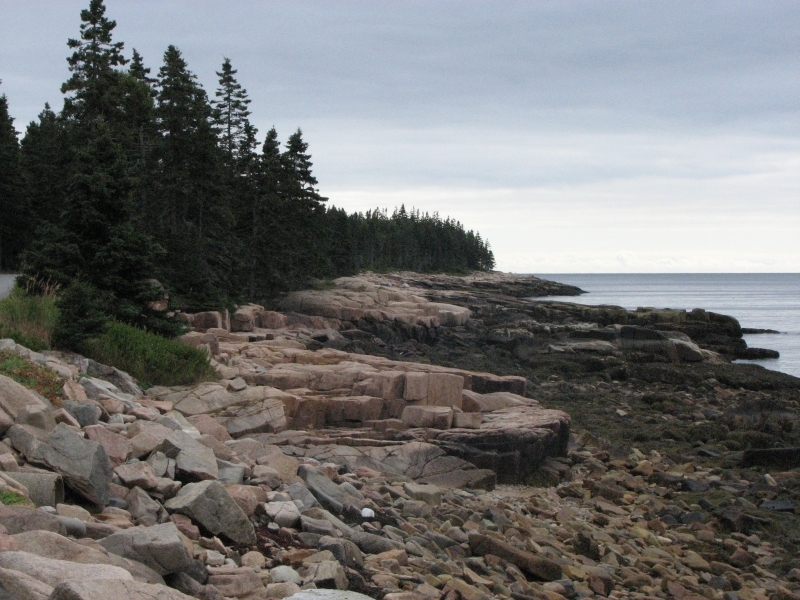 It was a pretty walk through the woods out to the pink rocks of the shore. 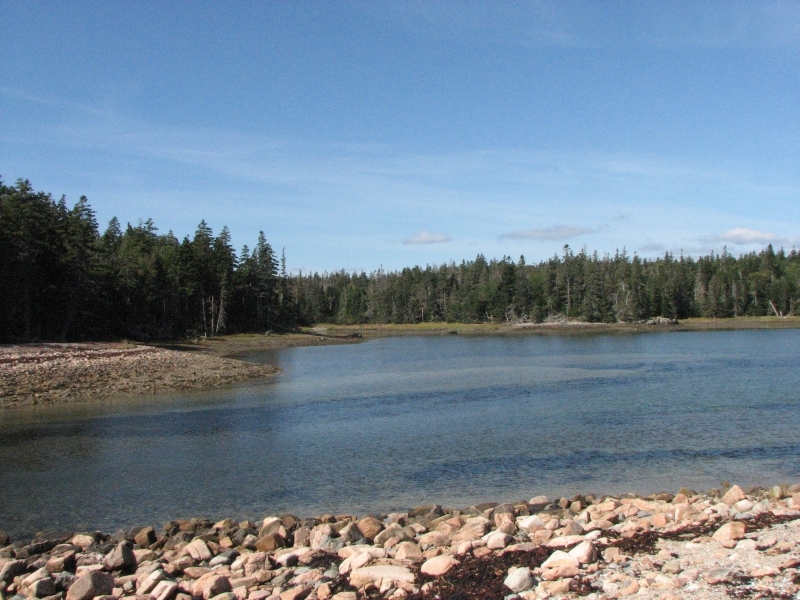 We checked out the tidal pools, and then followed the shore back to the car. It was a bright sunny day; no fog in sight. We drove the loop around the western side of Mt. Desert. The island is much bigger than I expected, with a lot of private lands interspersed with the National Park lands. 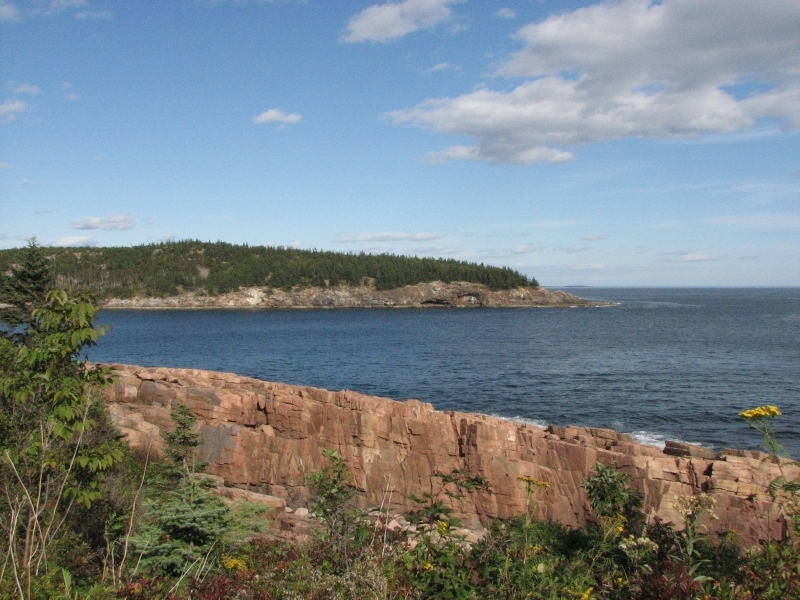 Evidently, Acadia National Park was created by land parcels purchased by wealthy philanthropists that were donated to the Federal government. At least 2/3 of the island is still privately owned. 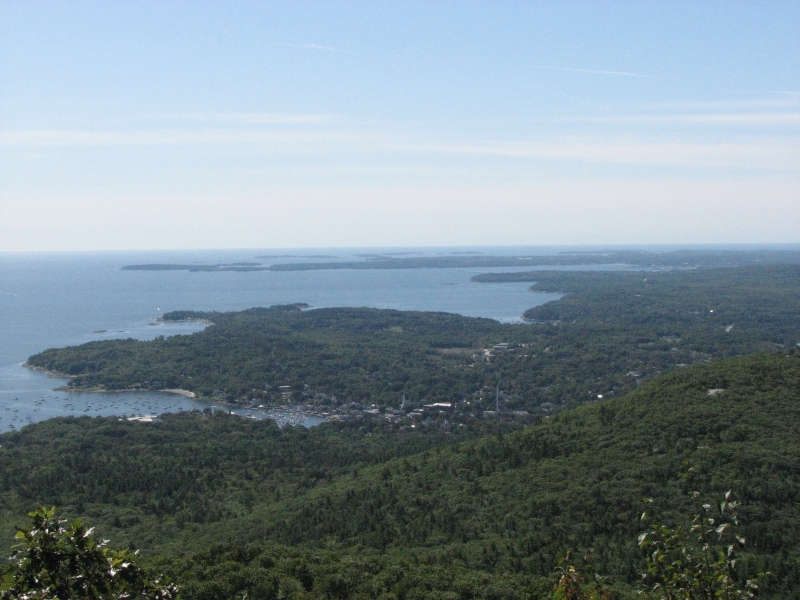 There are sections of park all over, but also several villages, as well as the infamous resort community of Bar Harbor. That town reminded me of Jackson Hole in Wyoming – what a zoo! I wanted to do a hike on the Hadlock Brook Trail. 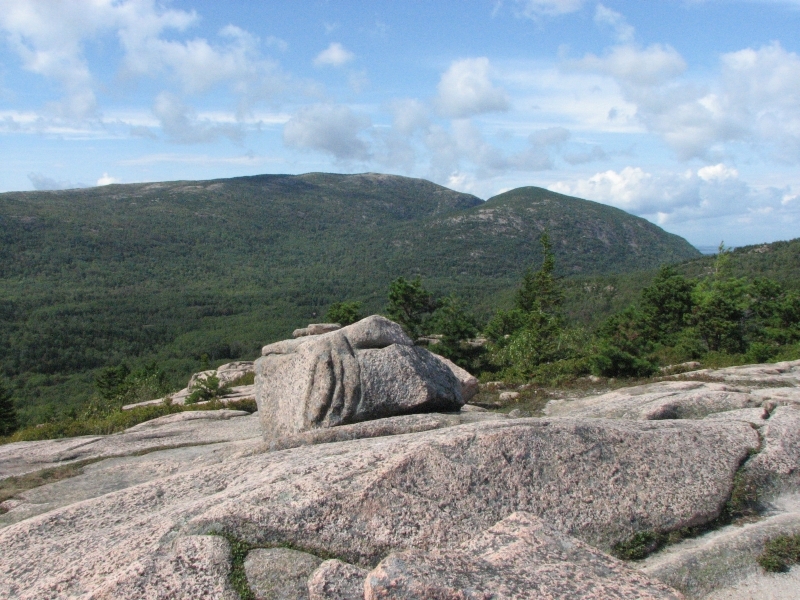 One of the tourist brochures recommended a short loop up Parkman Mountain. We never finished the hike. For a while, the trail followed a stream, walking on rocks and crossing the shallow water several times. 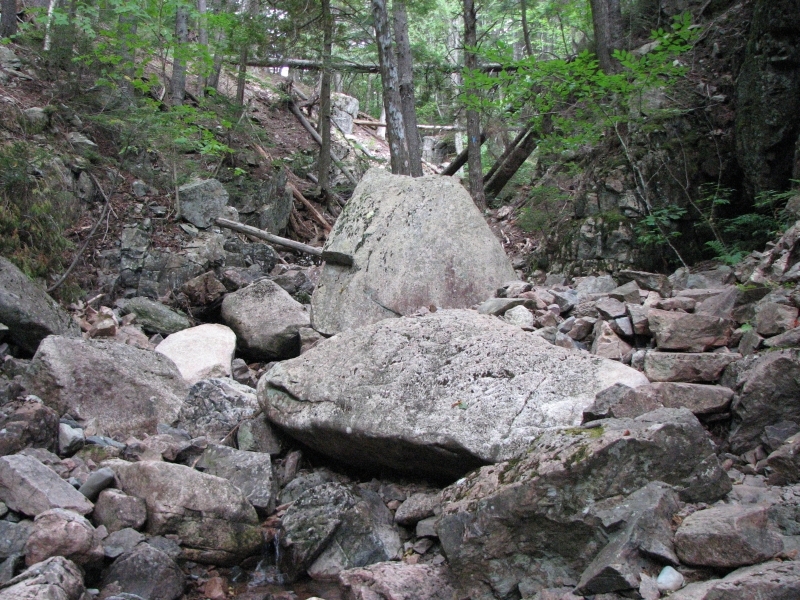 Then we began climbing up the Devils Slide Trail toward the peak on another rocky streambed. Jim slipped on a wet or loose rock and went flying. He smashed his head, and pulled something in his leg. Aside from the blood, his head was okay, but he could barely walk. I offered to go for help, but Jim insisted on walking out. We dropped down to one of the old carriage roads, now used as a bike trail, and hobbled out a mile or so to the highway. I walked down ¼ mile to the car and came back to pick him up. Jim said he was feeling all right, so we drove out to the visitors center to check out the exhibits, ate a late lunch in the car, and began driving the scenic drive again. 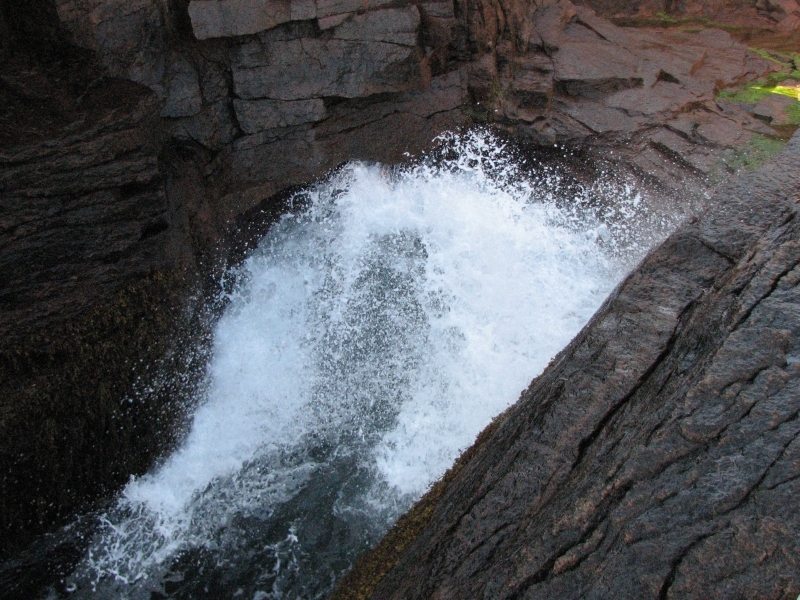 Jim wanted to see Thunder Hole, which he missed yesterday. We were too early for maximum effect (high tide today is after 7:00 p.m.) but we got the basic idea. The tide rolls in and out of a hole in the rocks. About every 12th wave, it shoots up, full force. It was fun to watch. Finally we headed back to the campground where we stayed two nights ago. It was much quieter on a week night. In fact, it was half empty. 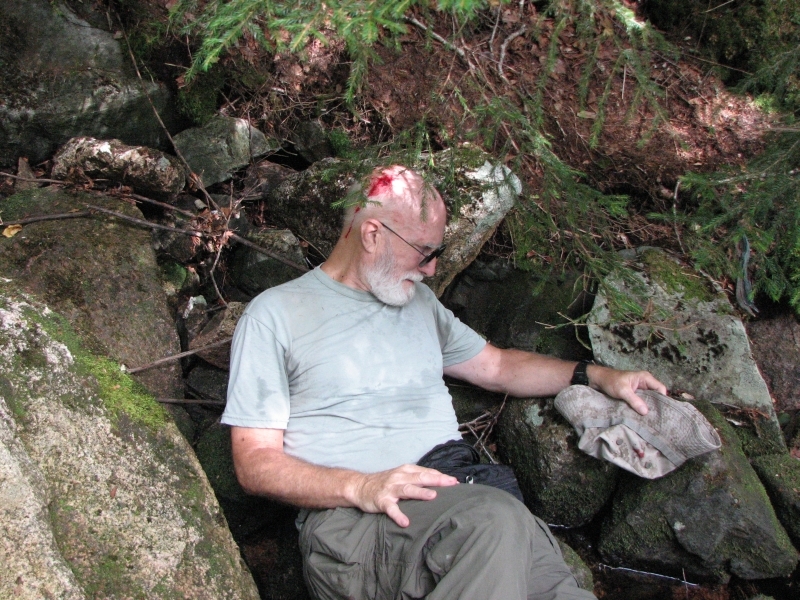 We had intended to do another hike, but Jim wasn’t up to it and I really didn’t want to leave him while he was hurt. So instead we spent a quiet afternoon reading under the trees. Jim is still in a lot of pain, but he’s moving a bit better than yesterday. No sign of concussion, despite the huge hole in his head. Since hiking is out for a few days, we decided to go petroglyph hunting up the coast. 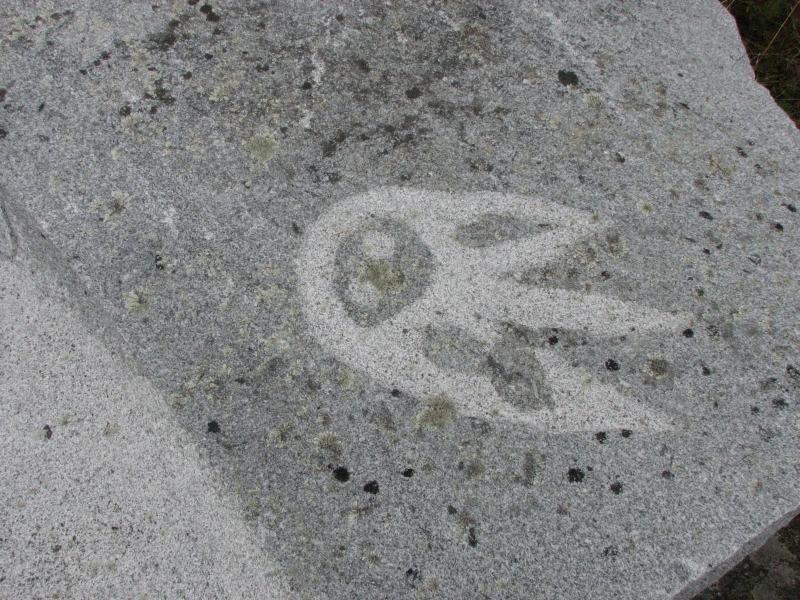 There are at least three rock art sites in and around Machias Bay. 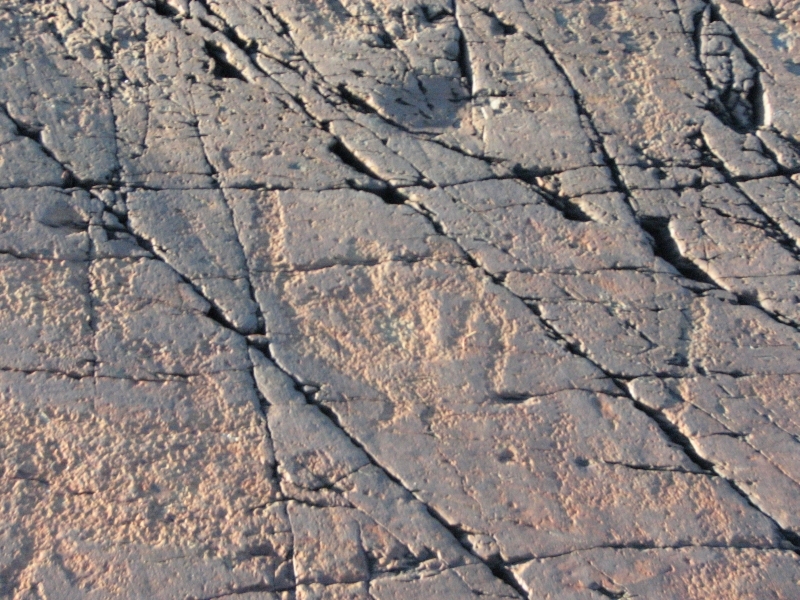 One is on an island, so beyond our ability to reach, but the New England petroglyphs book mentioned two specific areas that looked like they might be accessible, though one might be mislabeled. We went searching and found the general area of the first site, but there was private property all around and we didn’t want to trespass, so we stopped at the township office to ask if they knew whether the petroglyph site was accessible. We arrived just before closing, but Jim Clark was willing to talk to us about it. Seems he has a NASA contractor background, like Jim, so the two men ended up talking about old times for 45 minutes. He showed us on a land map where the petroglyphs are located, told us it was owned by the Passamoquody tribe and we could gain access more or less legally. He also told us about another site that may be the one in the book that seemed to be mislabeled, since it matches the location given as being on the opposite side of the bay, though the name is different. Although we didn’t go far today, the day sped by. We got a late start because it was raining when we woke up, so we stayed in bed until 9:15, when it stopped raining for a while. We packed quickly and drove to Ellsworth for breakfast at Dennys. We found a good used bookstore, where we browsed for an hour or two, then spent time at a pharmacy waiting out another heavy rain shower, then got rain again at lunch. However, when we went out to the shore the sun was out, though clouds threatened more rain. 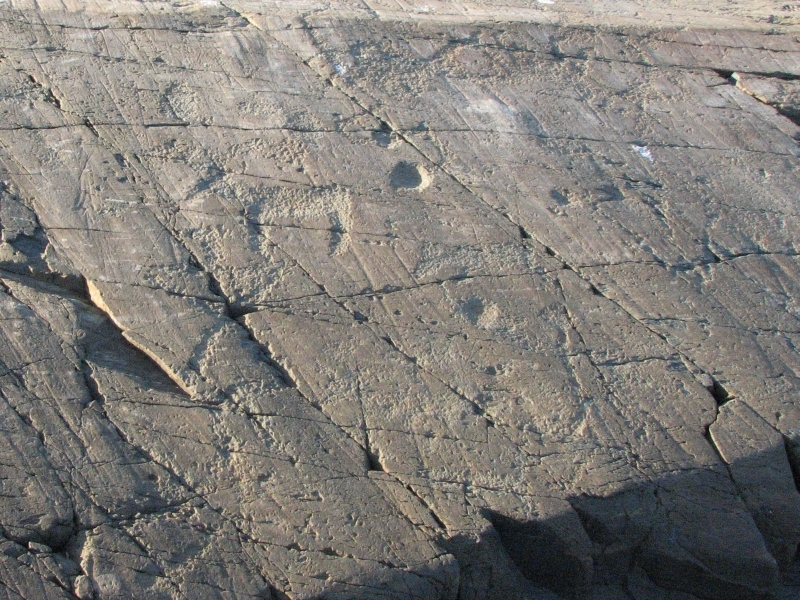 On our first attempt at finding the petroglyphs, we walked down to a very rocky beach, looking for a likely ledge or large boulder. We spotted someone collecting mussels far out on the mud flats, but didn’t find any carvings, so we turned around. On our second attempt, after our visit to the town office, we had better luck. 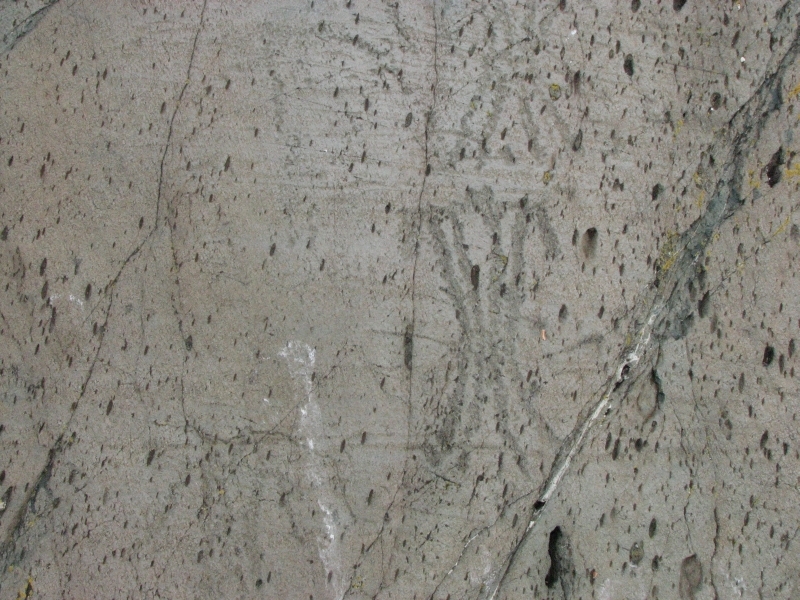 There was a ledge covered with pecked images. Some were clear – animals and people – others were more obscure. It was fun finding them. By the time we finished taking pictures, it was getting late, so we decided to get a motel in town and look for the second site across the bay in the morning. I hope it won’t be under water. 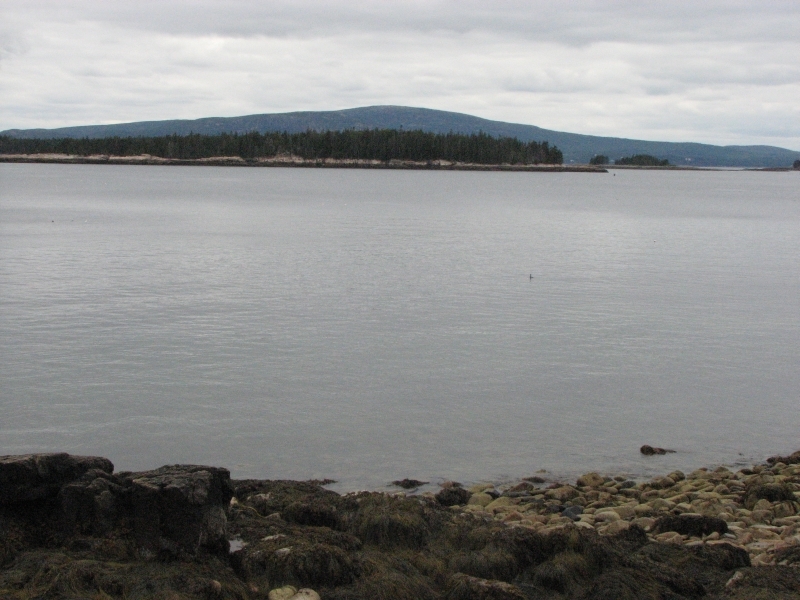 The rock today gets immersed at high tide, which is one reason many of the images were hard to make out. Although the motel was overpriced for what it offered, we were overdue for a shower, so the room was welcome. 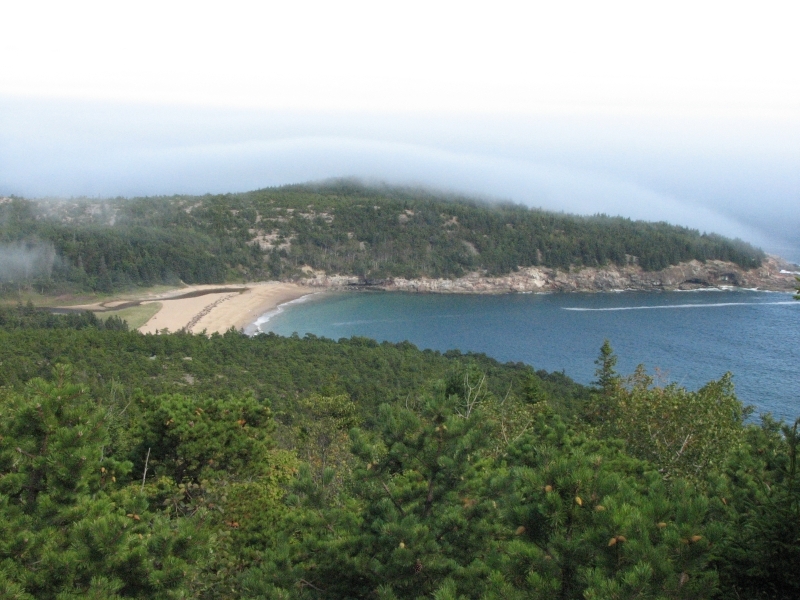 Acadia’s campgrounds don’t have showers, so the last three nights we’ve stayed stinky. Given the weather, it’s nice to be indoors. Jim did well with the short walks we took looking for the petroglyphs, but he’s still hurting. It was a cold gray day, but dry. 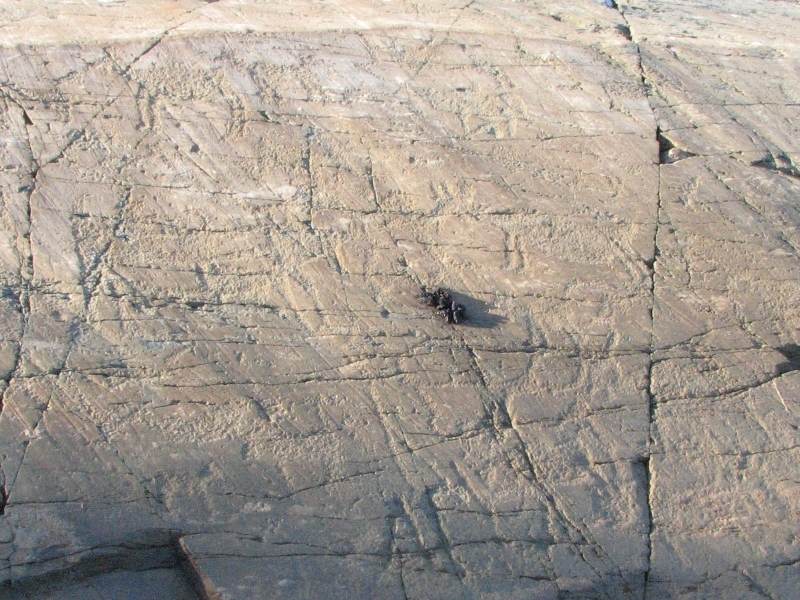 After a very filling breakfast, Jim and I went in search of the other petroglyphs near Machias. We followed a narrow and overgrown dirt road out to the ocean, then searched the rocks and ledges for the carvings. I did find a half dozen or so, but no more than that. I don’t know whether we were in the wrong place or not. 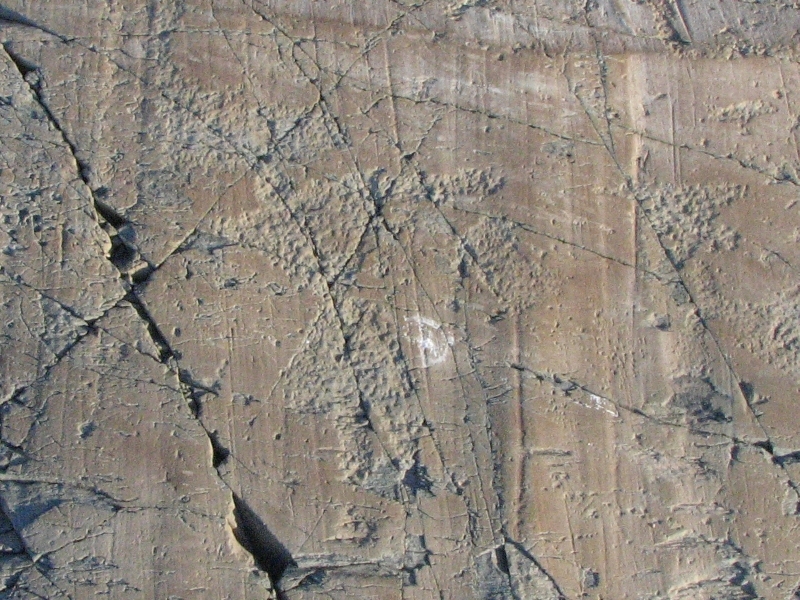 One of the images was very clear, the others were pretty faint, but they were definitely anthropomorphs. Of the 500 carvings in the Machias Bay area, we only saw 20 or so, but then the original description was over 100 years ago. A lot of weather and human activity has happened since then, not to mention high tides. 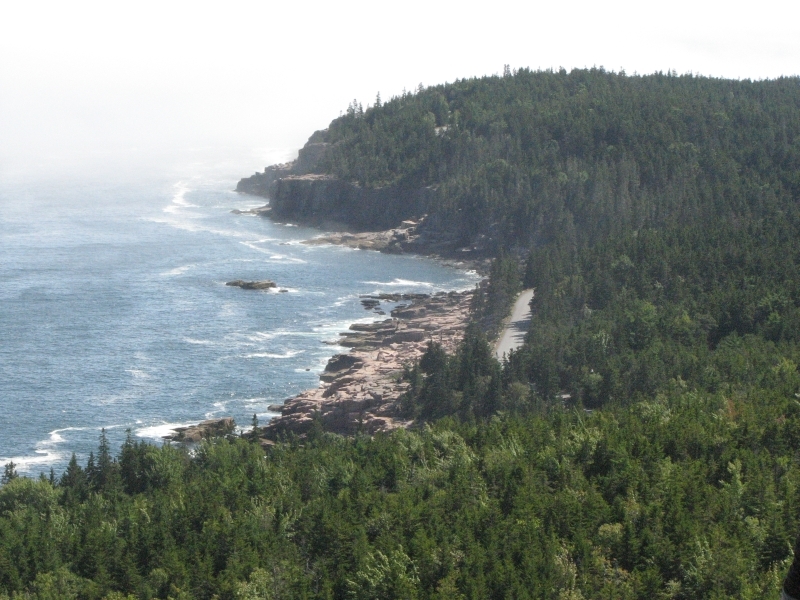 We had planned to go back to Acadia for another day, but given Jim’s pain, there’s no point. If we can’t hike, why go? We drove through Ellsworth, got salad at the grocery for dinner, and finally found a nice campground by a lake. It was expensive ($30) but better than the first campground we stopped at that cost even more. Canoes are included in the campground fee, and I’ve wanted to go out on the water again, so we may try that in the morning. Today never did warm up, but all in all it was a pretty good day. Seeing the wildlife (seal, otter, birds and porcupine) made it even better. It was a cold night, but we slept well in our warm cocoon. Still, when we got up, the idea of a canoe ride over the lake lacked appeal, despite the sunshine. Again, the temperature never reached 60 today. We headed south along Route 1, by now a very familiar stretch of highway. Lunch was at Tim Horton’s (maybe our last chance for a while) and we made a leisurely drive to Freeport, home of LL Bean and a big outlet town. We ended up shopping at both the regular LL Bean store and the outlet. Jim almost bought some boots, but decided to wait. We only visited part of the store. There were at least four separate buildings, just for LL Bean. Then there were all the other outlet shops, which we didn’t even look at. Jim’s leg was painful, so we decided to limit our shopping. A few miles out of town there is a private campground on the water. Because of its location, it was expensive - $30 plus $1 for the shower. Given that the bathrooms are just pit toilets, that’s not right. However, we didn’t want to spend the rest of the day looking for a better deal, and at least this campground is quiet. There are other people camped here, but not in our immediate vicinity. Like last night, a lot of RVs were left in place and only get used on weekends. It seems to be common practice in many of the private campgrounds and even some of the government ones in Canada. 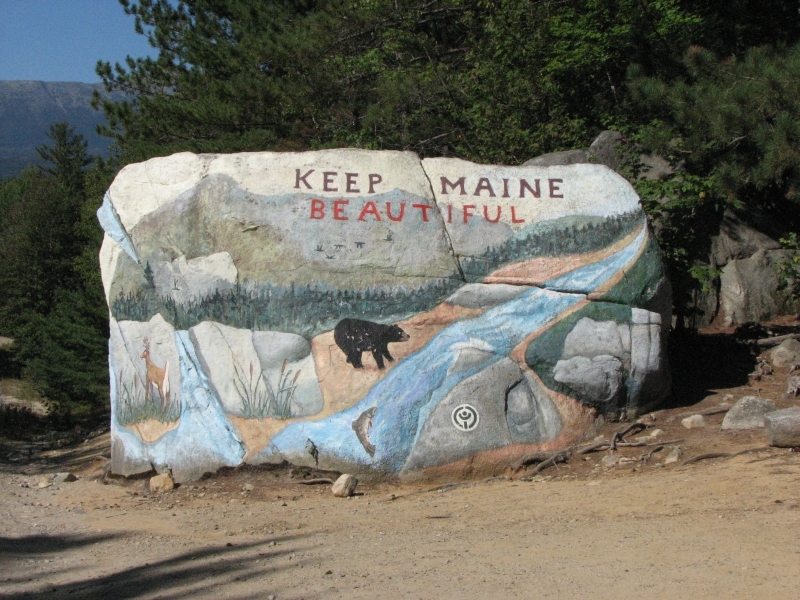 Most US federal campgrounds have a 14 day limit, which prevents that kind of seasonal rental, or one family taking one of the prime spots for the summer but not using it most of the time. Anyhow, today was a good day. 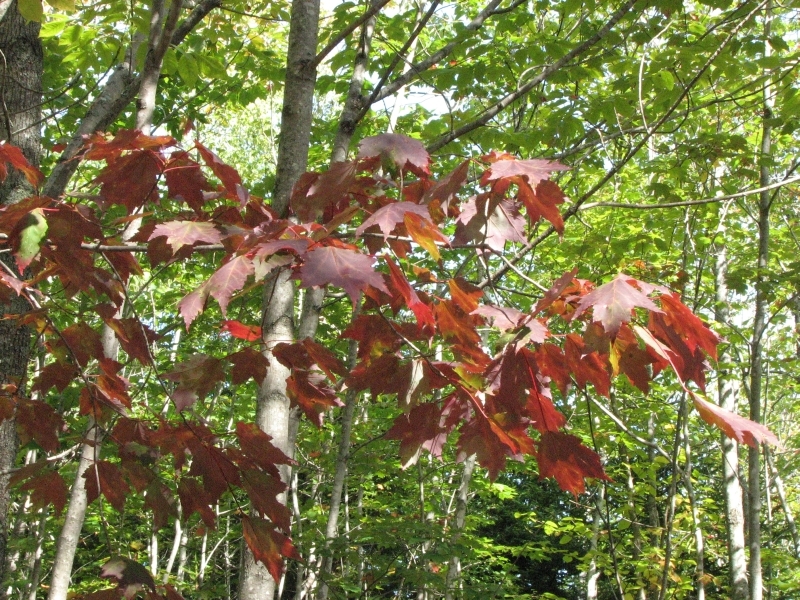 The leaves are noticeably more red and gold than they were a week ago. It’s still just scattered trees, but there are more of them than before. Traffic was bad along Route 1, at least in the towns, but it was fun to see the shops and some of the pretty Victorian houses. A lot of the B&Bs are “painted ladies”. I like the small fishing villages better than the tourist areas, but this part of Maine seems to be mostly resort communities, at least along the highway. Freeport was insane when we visited in 1992; it’s even worse now. 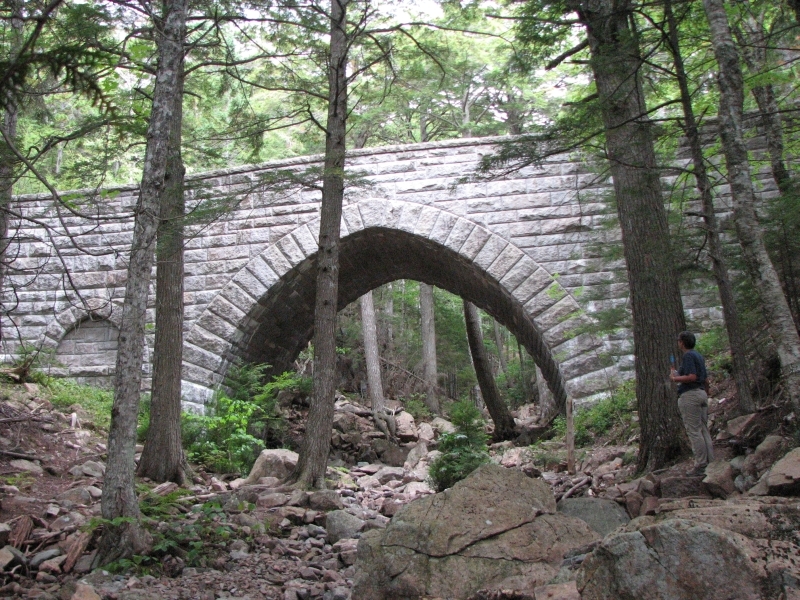 Jim: The last stops on our IAT tour were Millinocket, Abol Bridge and Mt Katahdin in Maine – which we visited but did NOT climb. But it brought back a lot of memories. Nuff said about that. Crossing back into Maine was a small adventure - it was the first time I've ever had the Border Patrol search the truck - or even my pack. I think they usually figure I'm too old to be up to much mischief. These guys must have been bored. It was good to spend a couple days with Ginny's father and stepmother. She doesn't get to see nearly enough of her family. 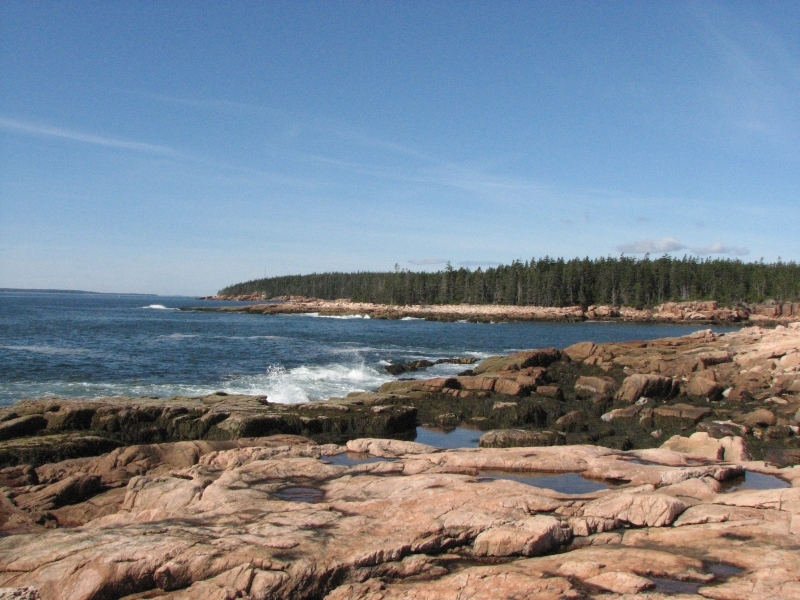 Since we were on the Maine coast, Acadia was a must stop. Lots of good hiking - if you don't slip and fall on the rocks. Damn, that hurt. 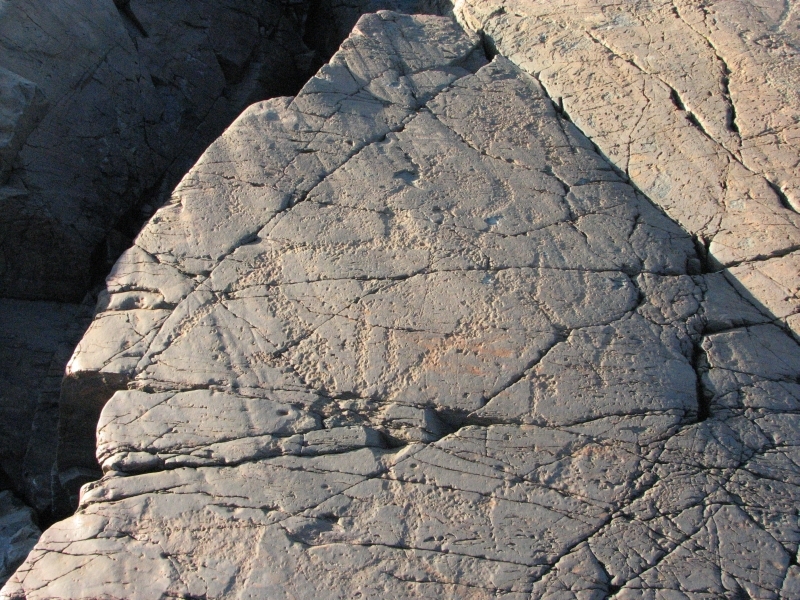 The petroglyphs on the coast were interesting, but nothing like the ones in the Southwest states. Seems these guys liked to carve them where the tide would wash them and keep them clean. The tide also eventually destroys them. Which actually may be part of the plan. The stop in Freeport was preplanned. We'd stopped there after our 1992 AT hike, so we wanted to see how the place had changed in 17 years. Yup - it changed - it's even more crowded than it was in 1992. But LL Bean was still there, so we got some clothes, looked at boots and camped down the road.